Cate Sevilla is an editor, journalist and consultant who has led editorial teams for some of the world’s largest media and technology companies. Born in the Silicon Valley, Cate has lived in the UK for 13 years, where she started her career as an editor and writer for the UK’s first blog publishing company, Shiny Media. In 2008 she founded the online women’s magazine, BitchBuzz, and worked across various projects with brands and publications, such as Stylist Magazine, Big Brother and Very.co.uk. After BitchBuzz closed in 2013, she joined Microsoft as an editor for MSN, and later became one of the founding members of BuzzFeed UK, helping to grow and manage their award-winning editorial team first as Homepage Editor, and then as Managing Editor. In 2016 she joined the tech start-up DRIVETRIBE, founded by the former Top Gear presenters, as Director of Content Operations. Cate was later headhunted by Google’s Cultural Institute to lead the editorial strategy for their consumer app, Google Arts & Culture. As an advocate for diversity and representation, with a strong passion for amplifying the voices and stories of women, Cate was thrilled to join The Pool, an online lifestyle platform founded by Sam Baker and Lauren Laverne, as its new editor-in-chief in 2018. After The Pool’s sudden closure in early 2019, Cate is a freelance editorial consultant and is currently working on her first book. 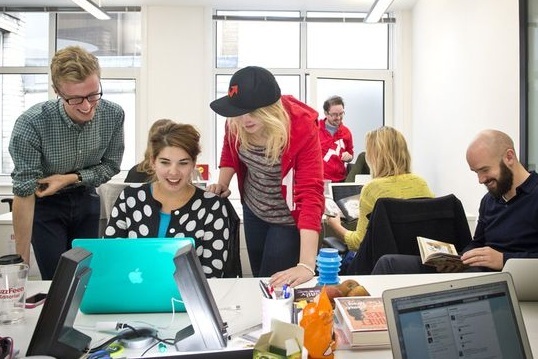 at the buzzfeed uk office in 2013.